When Marlene Dietrich told the Observer in 1960, “If I dressed for myself, I wouldn’t bother at all,” it was an unexpected confession from one of the world’s enduring symbols of sophistication and style. “Clothes bore me. I’d wear jeans,” the German star continued. 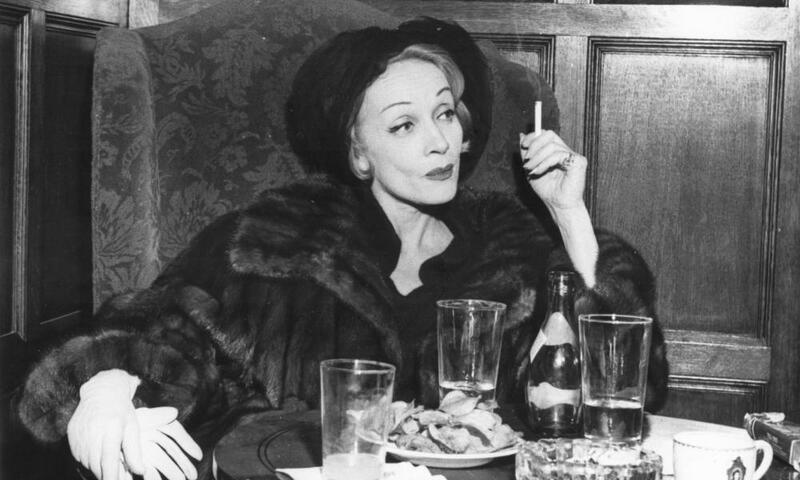 Yet from Dietrich’s earliest appearances on the cinema screen and in newsreel footage, her penchant for glamorous but androgynous outfits marked her out from other leading ladies. “I dress for the image. Not for myself, not for the public, not for fashion, not for men,” she explained, as the focus of a regular feature in this newspaper “in which women in various walks of life discuss their attitude to fashion and choice of clothes”. Twenty-five years after her death, a new exhibition celebrating Dietrich’s expert relationship with the camera has just opened in Paris, while in Washington another photographic show, Dressed for the Image, examines the construction of her powerful visual brand, and has taken its title from the 57-year-old Observer interview. Whatever Dietrich’s true feelings about her look, her carefully curated image was a political stance as well as a fashion statement. Her association with the liberated Weimar world of naughty cabaret, coupled with her resistance to Nazi attempts to co-opt her later career, made the actress a valuable wartime emblem of a free Germany. At the same time, the bold sexual taunt behind her haute couture gender-switching was designed to be both titillating and subversive. The fresh burst of fascination with the star this winter comes at a moment when the treatment of women in Hollywood is at the centre of public debate, running alongside a wider social discussion about the fluidity of gender identities. As a result, Dietrich’s powerful androgyny has acquired a new register: it seems a prescient challenge to the male hierarchy of the film industry and to restrictive sexual norms. It is also true that Dietrich’s love of wearing men’s clothes – she once said “I am at heart a gentleman” – was partly of its time. She was not so far away from the boxy, tailored looks sported by other feisty Hollywood stars of her era, such as Katharine Hepburn, and, to a lesser extent, Joan Crawford or Barbara Stanwyck. It took talented photographers such as Irving Penn, Richard Avedon, Eve Arnold and Cecil Beaton to build the Dietrich myth. In one famous shot, taken by the Paramount stills photographer Eugene Robert Richee, the actress wears a top hat, white tie and tails, while a cigarette hangs from her lips. Dietrich claimed this gentleman-about-town look was inspired by Vesta Tilley, the popular English music hall performer, but her own version was more delicate and highly polished. This sense of ambiguity had been deliberately put together by Dietrich in collaboration with her mentor, the film director Josef von Sternberg. He had made her name internationally with his 1930 film The Blue Angel, filming it in both German and English, and casting the 28-year-old actress from Berlin as Lola Lola, a louche cabaret star who manipulates an enamoured professor. The film became notorious for a scene in which a tailcoated Dietrich suddenly kisses a woman in her audience on the lips. In front of von Sternberg’s camera, Dietrich learned makeup, lighting and film-editing techniques that allowed her to stay in control of her image for many years. Dietrich was brave, too, in turning her back on her homeland. Charlotte Chandler’s 2011 biography recounts the personal performance the star had to put on in her embassy in order to have her German passport renewed. It was essential if she was to apply for American citizenship, eventually granted to her in 1939. She could not let the Nazi authorities know she would not be returning, despite the lucrative film deals and artistic freedom they offered. Dietrich’s films were later banned in Germany, while she went on to be awarded the US Medal of Freedom for entertaining troops on the frontline. 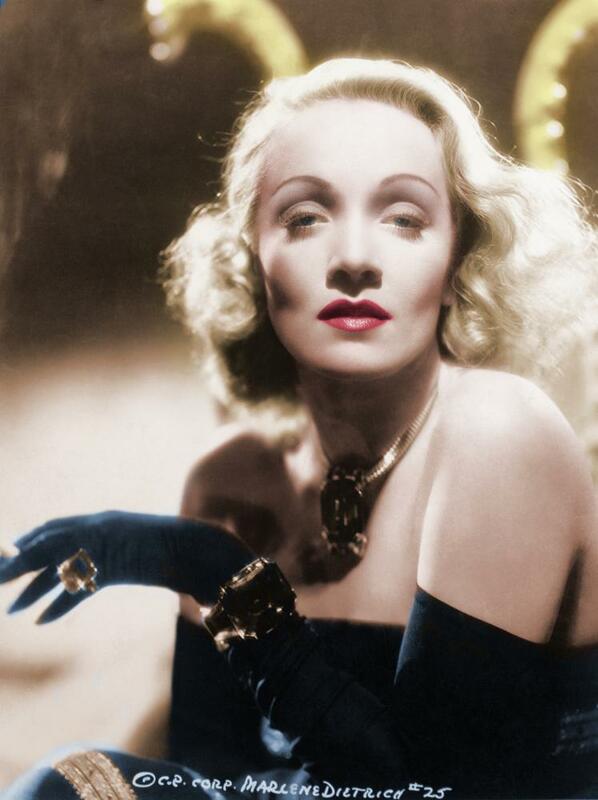 In later life, the Dietrich image was a struggle to maintain. Chandler describes the efforts her couturiers made to recreate the magic. Drink and prescription drug addictions did not help, but cosmetic surgery tightened her features, while soft-focus camera lenses did their best. The murmur in the quiet hotel bar froze. Quite suddenly, in a few silent strides, Marlene Dietrich was there. She really is quite something. She was wearing a wild mink coat; a black Balenciaga dress embroidered, at the left breast, with the scarlet bar of the Légion d’honneur; a stiffened black tulle hat; white kid gloves; black patent leather pumps; and a black crocodile handbag. That’s all. But the quality of her body gave the mink a luxury no advertiser could ever buy: the black dress was littler and subtler than volumes of Vogue could imply, and her single decoration was somehow more worldly and wicked than all the jewellery in Paris, London and New York put together. Unlike the sculptured image of films, in which only the voice moves, she is alert and friendly. Her face has got lines, luckily: two deep ones from nose to chin and several on the forehead. It is alive with warmth and humour. She ordered coffee and the waiter brought it and watched tenderly over the first mouthful: “I dress for the image,” she announced. “Not for myself, not for the public, not for fashion, not for men. The image? A conglomerate of all the parts I’ve ever played on the screen. When I was in The Blue Angel people thought that was me: they really thought that was me! “If I dressed for myself I wouldn’t bother at all. Clothes bore me. I’d wear jeans. I adore jeans. I get them in a public store – men’s, of course; I can’t wear women’s trousers. I cant remember when I last got a new pair. They last so long and get better and better. But I dress for the profession. I get my clothes in Hollywood and Paris, and if I can’t come to Paris, I wait. “I never go to a collection. It takes too long to pass. They know me now and they show me only the clothes that are mine. I never consider money when I order clothes. Before I had money? I don’t remember. “Yes, I have good taste. It must have been the influence of my mother because it has always come quite naturally. No one else has ever had any effect at all on my clothes. Of course, if I am with someone who I know wants to show me off then I dress so that they can show me off. And I dress according to what I am doing – that is what taste is – and the country I am in. In Paris you can be more crazy. New York is a practical place. “I have never interfered with my daughter’s clothes. So long as she feels comfortable herself. If she asked for advice, I would tell her to buy something good.